Lightning strikes the earth about 100 times every second and can heat the surrounding air to up to 50,000 degrees Fahrenheit (The Weather Channel). As such a destructive force, it’s no wonder lightning damage caused $790 million in homeowners insurance losses in 2015 and an average of almost $8,000 per paid claim (Insurance Information Institute). Moreover, these amounts are expected to rise as the average number and value of electronics within a home increases. The rising cost of lightning damage claims illustrates the importance to insurance carriers of properly identifying the peril prior to making a settlement decision. According to a study conducted by Vaisala of 14,000 lightning claims from a top insurance carrier, 30% had no recorded lightning strikes in the vicinity. If each of those claims were settled for the average settlement amount of $8,000, that would have resulted in over $33 million of indemnity leakage. To make matters worse for claims involving HVAC equipment, many symptoms of age-related wear & tear are often misdiagnosed as lightning damage. We’ve put together an overview that illustrates the symptoms of lightning, surge, and wear & tear damages, to help adjusters settle lightning claims with a greater degree of accuracy. The outdoor placement of the condensing unit or packaged unit lends itself to direct lightning damage. This type of damage is almost always limited to the outdoor equipment. With confirmed lightning damage, there will always be visual evidence of arcing and charring of the equipment casing and/or housing. 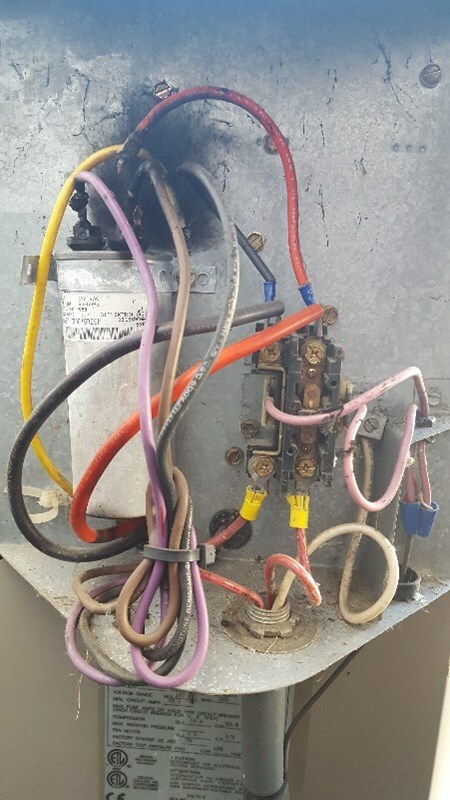 Additionally, multiple outdoor electrical components will be damaged, such as the contactor, capacitor, compressor, and fan motor. While lightning damage is the most frequently claimed cause of loss to HVAC equipment, lightning is very rarely the actual peril to the system. Most often, HVAC systems reported as a lightning damage are in fact damaged by wear & tear, surge or, perhaps worse, not damaged at all. A voltage surge occurs when there is a spike in the home’s or business’ electrical current. 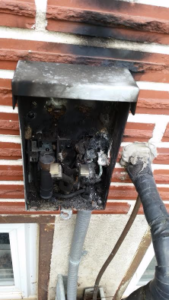 While this could be caused by a nearby lightning strike, it could also be the result of the utility company switching grids, or even internally when larger appliances turn on and off (State Farm’s Simple Insights). Surge damage in an HVAC system is typically much less severe and more common than direct lightning damage. A surge could cause damage to multiple components and often includes the contactor and capacitor. Additionally, large portions of wires will often show visual signs of overheating in the form of melting and/or arc marks in surge events. Many symptoms that are actually caused by age-related wear & tear are often misdiagnosed as lightning damage to an HVAC system. In fact, in 2016, 48% of claims reported as lightning damage were found to have failed due to wear & tear following an objective damage assessment. One major indication that the damage was simply caused by age-related wear & tear is when a single component fails, such as the compressor only or capacitor only. 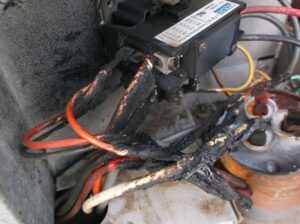 Another sign of wear & tear is charred wiring within 2” of the component connection, as this is typically a sign of loose wiring connections. The final misdiagnosed lightning symptom is acid in the refrigerant. Acid builds over time when moisture or contaminants enter the refrigerant, and does not occur instantaneously following a lightning or surge event. The frequency of lightning claims (and often their misdiagnosed symptoms) underscores the importance of engaging an objective expert prior to making a coverage decision. By ensuring that lightning claims are settled accurately, insurance carriers can reduce their risk of indemnity leakage. For more information on HVAC lightning damage, request a copy of our HVAC lightning damage overview.